- is an Open-Source Integrated Clinical Environment. 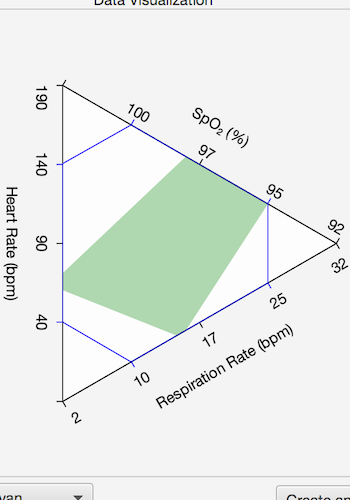 - is a prototype clinical ecosystem connecting medical devices and clinical applications. 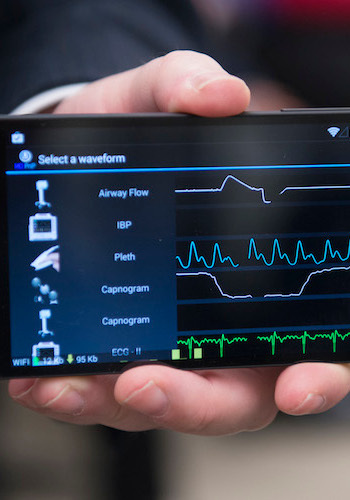 - provides a framework for the integration of devices and apps into the broader Medical Internet of Things. - a project of the MD PnP Interoperability Program. OpenICE is an initiative to create a community implementation of an Integrated Clinical Environment. The initiative encompasses not only software implementation but also an architecture for a wider clinical ecosystem to enable new avenues of clinical research. OpenICE seeks to integrate an inclusive framework of healthcare devices and clinical applications to existing Healthcare IT ecosystems. To learn more about OpenICE, check out our documentation. Looking for where to start with OpenICE? Check out this page for the basic information you'll need to get off the ground with OpenICE. This page is intended to help users become familiar with operating the OpenICE Supervisor. The Supervisor is used for running demonstration applications to interact with connected devices and simulators. All this data! What should I do with it? Input it into a demo app of course! This page will explain the purpose and operation of each one of our demonstration applications included with the Supervisor. Interested in connecting a supported device into your own OpenICE network? 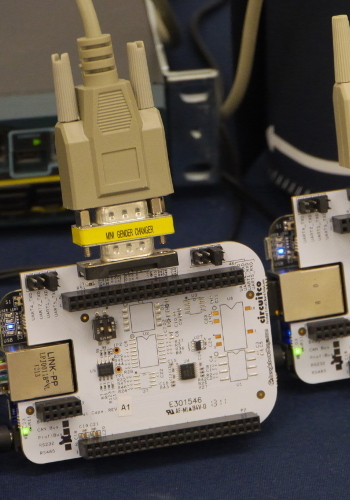 Follow this tutorial to learn the basics about a 'device-adapter' and how to install the device-adapter software onto a Beaglebone Black. The process shown here can be used to connect any supported device onto any Java compatible computer, including your laptop. This tutorial will show you how to configure a device-adapter to communicate with a Philips MP70. OpenICE is a highly flexible system that leaves users with many options for using the tech. 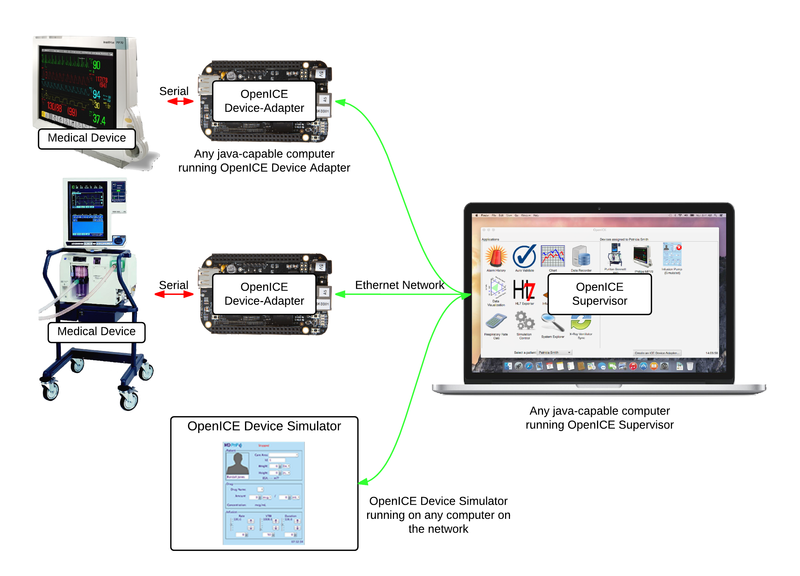 This tutorial illustrates three sample OpenICE configurations - single device, consumer, and enterprise. 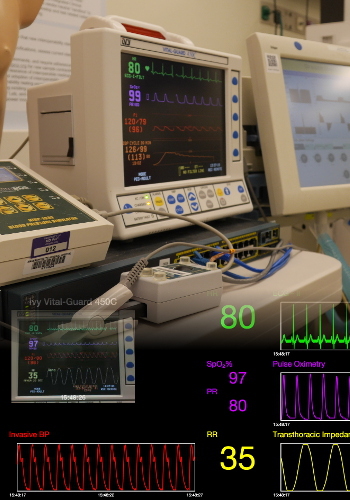 The Infusion Safety Application Architecture Description provides a high-level survey of key architectural components of the current implementation of an Integrated Clinical Environment (ICE) devised at the MD PnP Interoperability Lab in Cambridge, MA. This document offers readers a targeted glimpse of key design features of that implementation that pertain specifically to the PCA Infusion Safety application. Want to use the OpenICE platform for something new? Write your own OpenICE app! The code repo hello-openice will help you tackle basic device subscription, vital signs collection, and more. Documentation for Building an App from "Hello, OpenICE!" This page lists the alterations we make to the default Beaglebone Black Debian disk image while creating the 'device-adapter' disk image. Self explanatory. Helpful information for building the OpenICE project from source. These instructions are aimed at experienced software developers looking to work with the source code of the OpenICE project. In the lab, we use a variety of external tools in our research and development of OpenICE. This page lists tools and resources we would hate to live without. Ask questions, share knowledge, find answers. The lab here at MD PnP is constantly expanding it's capabilities and collaborations. Check out our current capabilities, equipment and infrastructure. Take an in depth look at OpenICE in this technical presentation. Lead developer Jeff Plourde explains the fundamentals of our distributed system and our use of the DDS middleware. After viewing this webinar, you will understand the basic operating principles of OpenICE. Learn more about the OpenICE platform and where to find the software from this quick webinar! 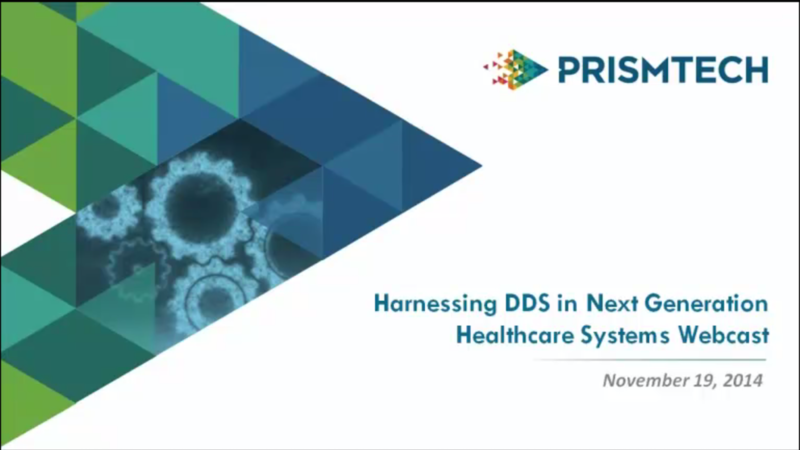 Checkout the members of the MD PnP team presenting in PrismTech's webinar "Harnessing DDS in Next Generation Healthcare Systems Webcast." Learn about DDS and it's use in the OpenICE prototype.